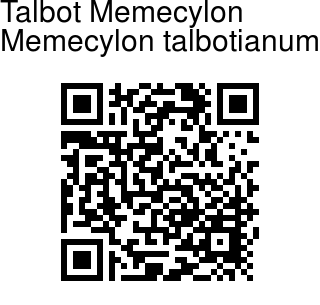 Talbot Memecylon is a Trees ca. 8 m tall. Bark grey, finely minutely fissured. Branchlets are cylindrical, hairless. Leaves are simple, opposite. Leaf-stalks 0.5-1 cm long, planoconvex in cross section, hairless. Leaves 5-10 x 1.8-5 cm, elliptic, elliptic-lanceshaped, tip narrowly long-pointed, base narrowed t o flat, margin entire, thinly leathery, drying olive green or yellowish and rugose. Midrib is slightly channelled above, secondary nerves obscure. Flowers are blue, borne in leaf axils or lateral fascicles on short peduncles. Berry is up to 0.8 cm across, turning yellow when ripe, seed 1. 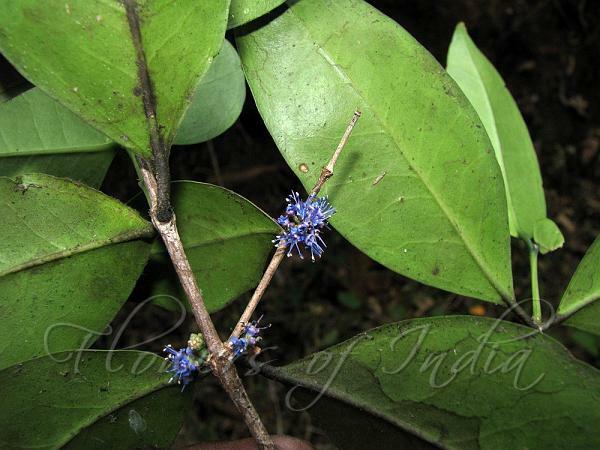 Talbot Memecylon is Endemic to the Western Ghats.